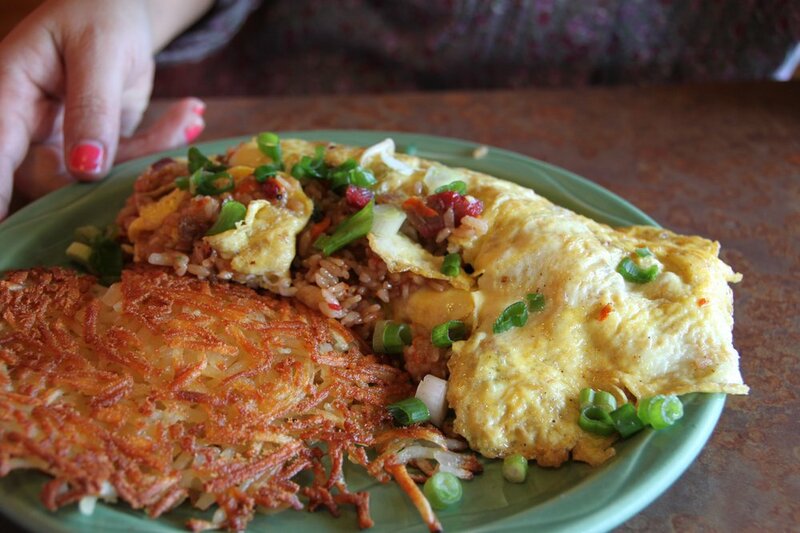 At Kountry Kitchen, we think breakfast is the most important meal of the day. We serve hearty portions of good food; using fresh and when available, local ingredients. We're known for our plate-sized Macadamia Nut Pancakes with House-Made Coconut Syrup, Kalua Pork Eggs Benedict, Homemade Corned Beef Hash and Giant Stuffed Omelettes. Last year, we added a full coffee and espresso menu, featuring house made syrups and locally roasted coffee from Kauai Roastery brewed on a Simonelli Aurelia II Machine. Check out our extensive menu below, we have something for everyone. All omelettes include a choice of hash browns, rice or fresh fruit and corn bread or buttered wheat/white toast and jelly. Kalua pig, spinach, cheddar cheese and onion. Spinach, sundried tomatoes, artichoke hearts, mushrooms and onions with Swiss cheese. Makaweli Ranch Ground Beef, onion, bell pepper, tomatoes and cheddar cheese. Kim chee, Portuguese sausage, onions, American cheese. Fresh mushrooms, bell peppers, tomatoes, onions and grated cheddar cheese. Ham, cheddar cheese, bell peppers and onion. Chili, sour cream, onions and cheddar cheese. American or cheddar cheese and ham. Served with choice of hash browns, rice, or fresh fruit in season, & corn bread or buttered wheat or white toast. USDA choice steak served with choice of hash browns, rice, or fresh fruit in season, & corn bread or buttered wheat or white toast. 2 scoops of rice, 2 eggs any style, Makaweli choice ground beef covered in brown gravy served with corn bread or buttered wheat or white toast. 2 scoops of rice, 2 eggs any style, slow roasted Kalua pork covered in brown gravy served with corn bread or buttered wheat or white toast. 2 scoops of rice, 2 eggs any style, housemade corned beef hash covered in brown gravy served with corn bread or buttered wheat or white toast. 2 eggs any style, 3 pieces of bacon, fruit in season & choice of 2 small plain pancakes or 3 pieces of French toast with cinnamon sugar. Add: Banana, chocolate chip, macadamia, coconut, or fresh strawberry & syrup with whipped cream for $2.00 each. Poached eggs, spinach, mushroom, tomatoes and olives on an English muffin, smothered in hollandaise sauce, served with choice of hash browns, rice, or fresh fruit in season. Poached eggs, grilled crabcake, avocado and bacon on an English muffin, smothered in hollandaise sauce, served with choice of hash browns, rice, or fresh fruit in season. Poached eggs and ham on an English muffin and smothered in hollandaise sauce, served with choice of hash browns, rice, or fresh fruit in season. Hawaiian sweet bread topped with Kalua Pork, smothered in hollandaise sauce, topped with lomi lomi salmon, served with choice of hash browns, rice, or fresh fruit in season. Homemade corned beef hash served with choice of hash browns or rice and corn bread or buttered wheat or white toast. Any style, served with your choice of ham, spam, bacon, pork or portuguese sausage served with choice of hash browns or rice and corn bread or buttered wheat or white toast. Makaweli Local Beef Patty, teriyaki sauce, letttuce and mayo on a brioche bun with your choice of cheese. Served with choice of side salad, potato mac salad or chips. Makaweli Local Beef Patty,cheddar cheese, bacon avocado, lettuce, tomatoe and ranch on a brioche bun. Served with choice of side salad, potato mac salad or chips. Spinach, sundried tomatoes, artichoke hearts, mushrooms and onions topped with Swiss cheese on a bun. 6 ounces of fish grilled to perfection topped with lettuce, tomatoes, onions on a brioche bun, side of tartar sauce. Island smoked pork topped with tropical BBQ sauce served on a brioche bun. Bacon, ham, lettuce, tomato and mayo on toasted wheat or white bread. Savory smoked bacon , garden fresh lettuce , big beefy tomatoes and creamy mayo on your choice of wheat or white bread. An American classic! We can grill it with choice of American cheddar or Swiss. Island smoked pork with fresh spinach and onions. 12 ounces of fish grilled to perfection! A tender, 8-ounce USDA Choice steak, grilled any way you like it! Iceberg lettuce, shredded carrots, cabbage, avocado and tomatoes. With choice of 1000 Island,blue cheese or champagne dressing. Large cup of chili over rice and delicious melted cheese. Served with corn bread. LARGE PARTY? SKIP THE WAIT! We offer reservations for parties of six or more! please call 808-822-3511 between 6AM-2PM daily to make reservations.